by jessicasabo February 10, 2019 March 7, 2019 . 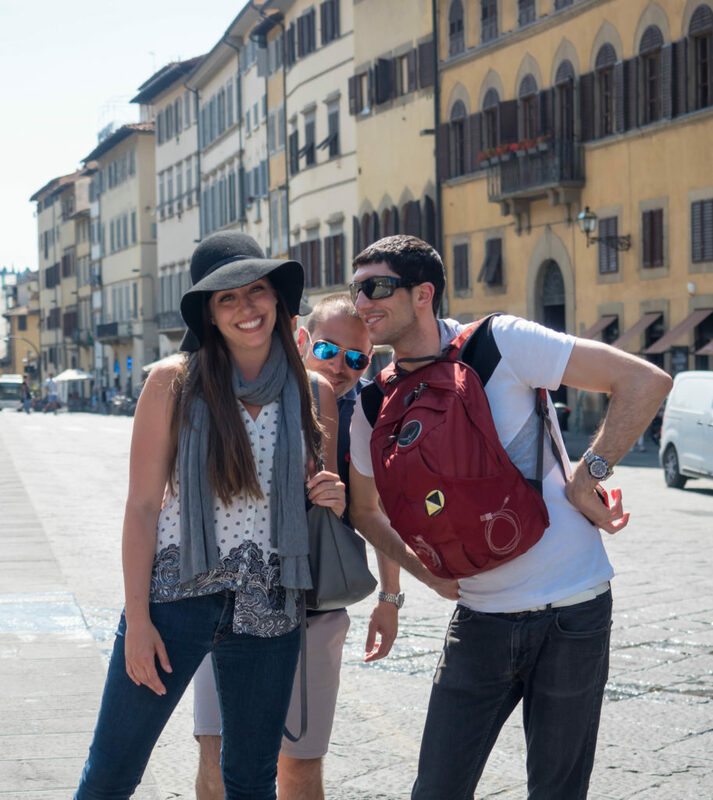 Florence, where do I even begin! 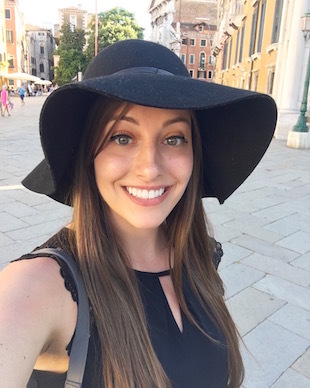 I’ve actually been lucky enough to go twice in the past two years – once in June of 2017 and again in November of 2018. I was only there for two days during my first visit, and I knew immediately that I had to return ASAP to explore more of the city and the countryside. This city felt quintessentially Italian to me, and I love how it still retains its Medieval feel. 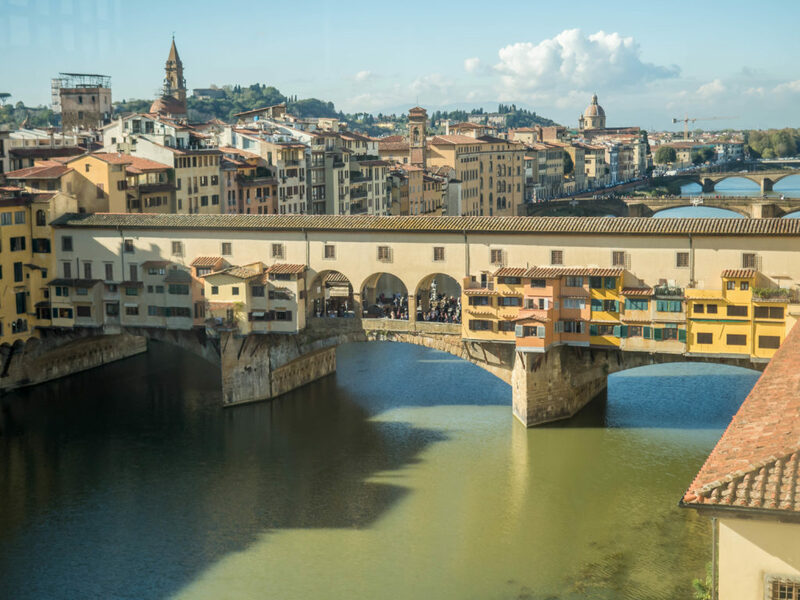 Florence is the birthplace of the Renaissance and it’s all things romantic and enchanting. Filled with incredible art, history, architecture, and food, it’s not hard to see why so many people have been drawn to this city before me. 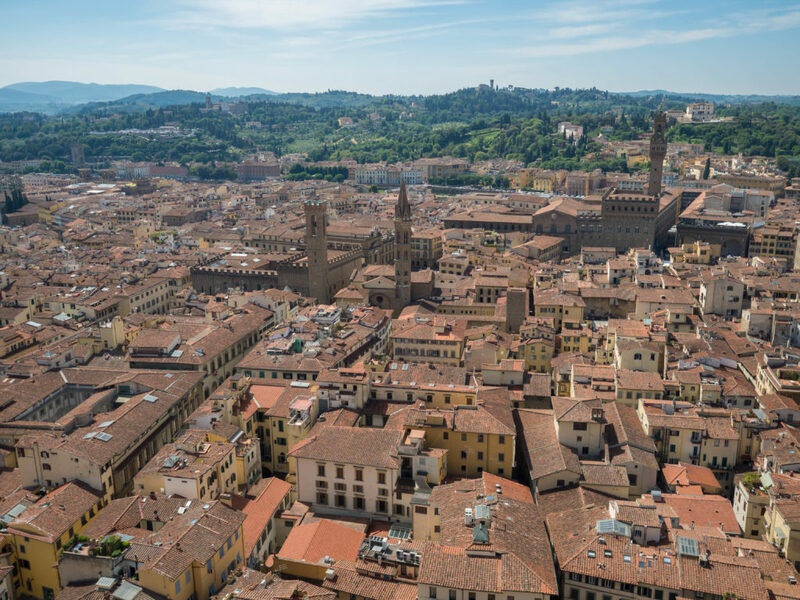 The city was an open canvas for artists like Michelangelo, Leonardo da Vinci, and Brunelleschi. 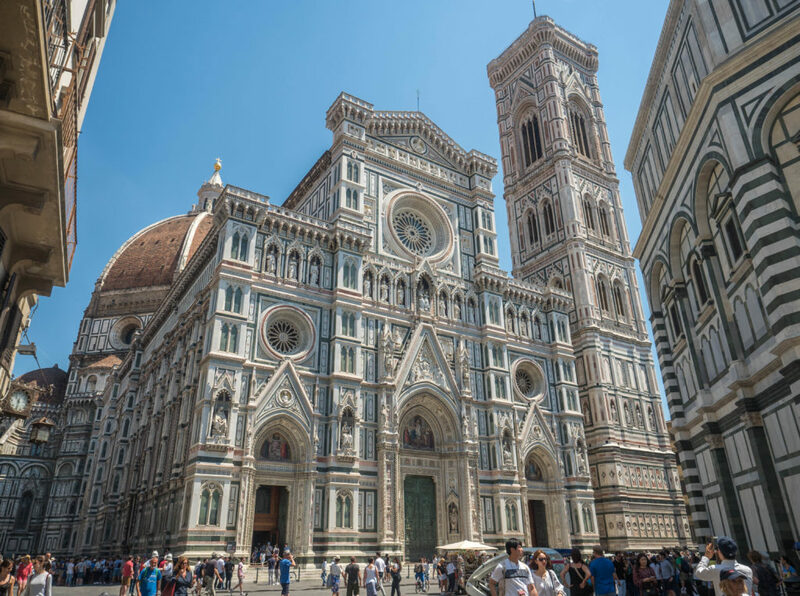 The main cathedral in Florence is the Santa Maria del Fiore, translated as the virgin of the flower. It’s one of the largest churches in the world. 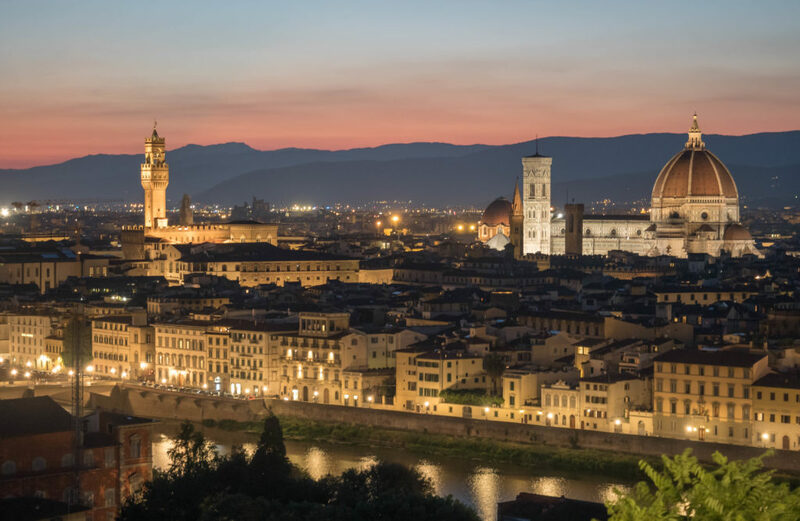 You can buy one single ticket that allows entrance to all parts of the museum including the Cathedral of Santa Maria del Fiore, Brunelleschi’s Dome, Giotto’s Bell Tower, the Baptistry of San Giovanni, the Crypt of Santa Reparata and the Opera Museum. You’re allowed entrance into each site once within a 72-hour period. Opening hours: Vary by site and season, so make sure to check before you go. 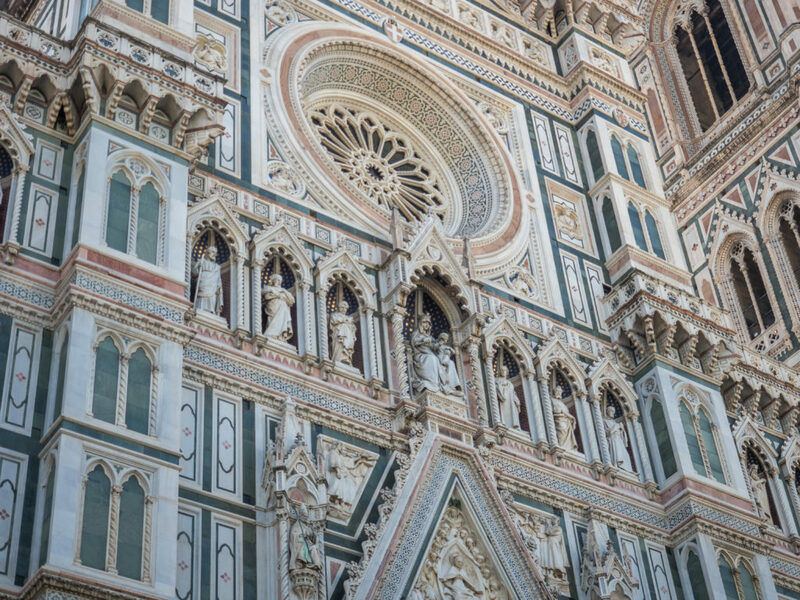 The exterior of this cathedral is just stunning. I saw a lot of churches during my time in Europe and I feel confident in saying the exterior of this one is my absolute favorite. Constructed from white, red, and green marble it’s just an incredible piece of art. I preferred the exterior of the cathedral to the interior, however, the inner shell of the dome is pretty spectacular. 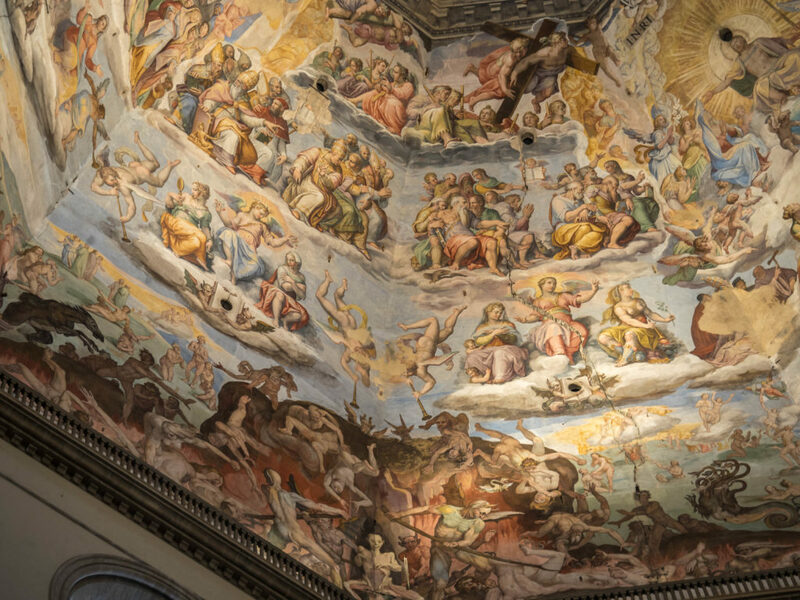 It was created by Giorgio Vasari and Federico Zuccari and depicts the scene of the Last Judgement. 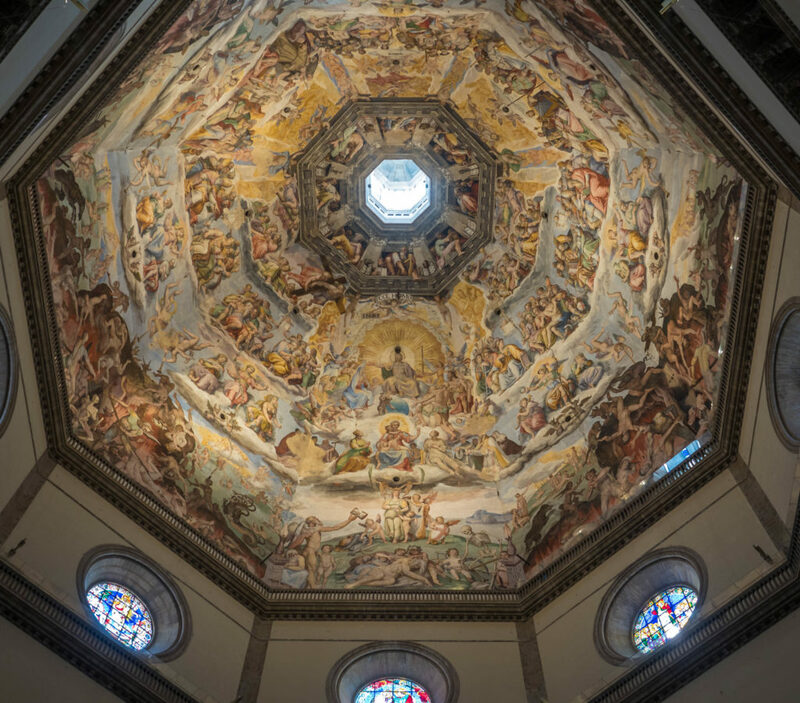 After viewing the frescoes from the floor, you can get an even closer look by starting your climb to the top of the dome. Keep in mind it’s 463 stairs to the top and there’s no elevator! 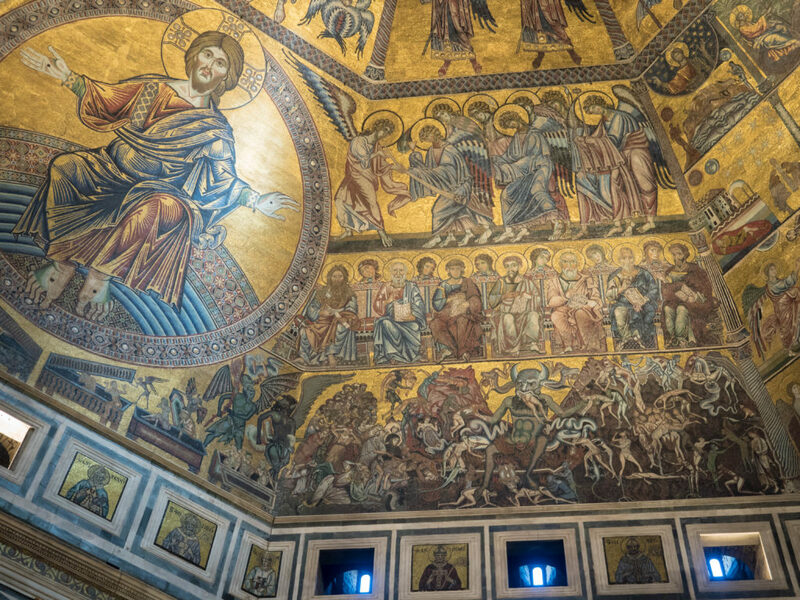 The baptistery is in a separate building that sits in front of the cathedral. As you enter the building your eyes are immediately drawn up towards the golden dome. 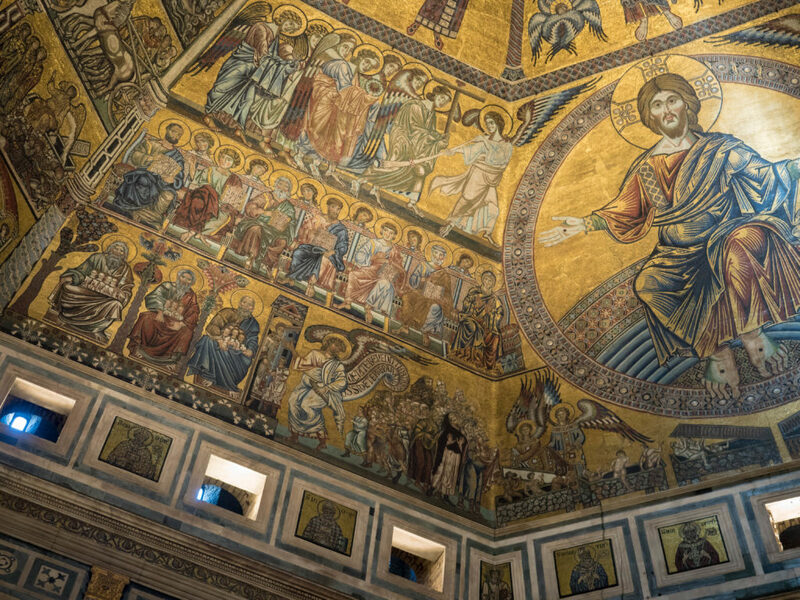 The mosaics contain a large figure of Christ, the story of John the Baptist, and the Creation of the world. 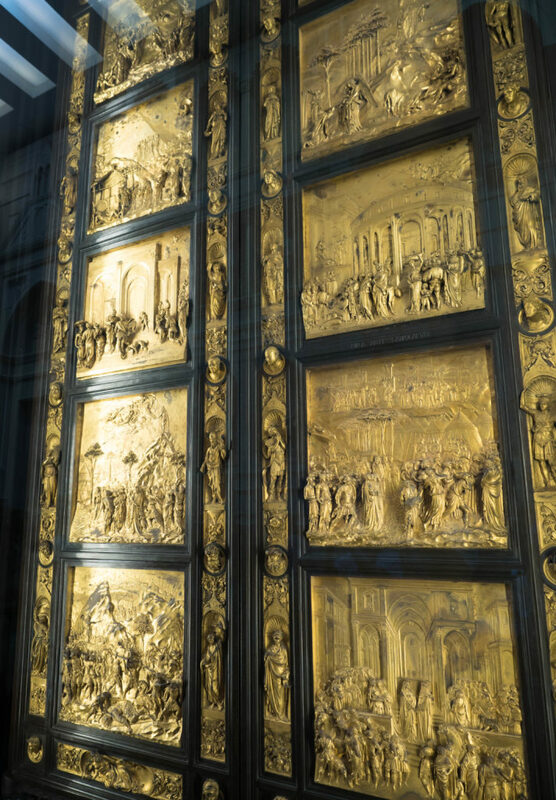 The main doors into the baptistry are known as the Gates of Paradise and they were created by Lorenzo Ghiberti in the 15th century. 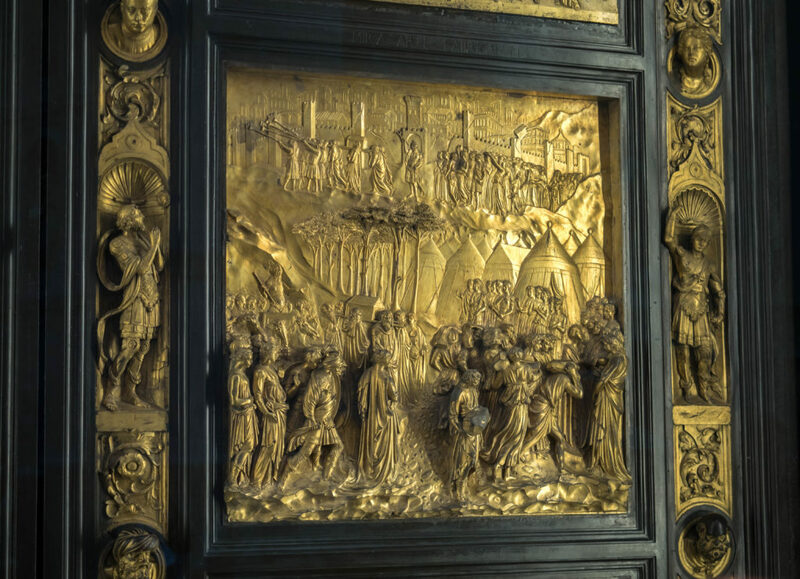 These bronze doors portray scenes from the Old Testament and over time have become a major symbol of Renaissance art. The scenes include Adam and Eve, Cain and Abel, Noah, Abraham, Jacob and Esau, Joseph, Moses, Joshua, David, and Solomon and Sheba. 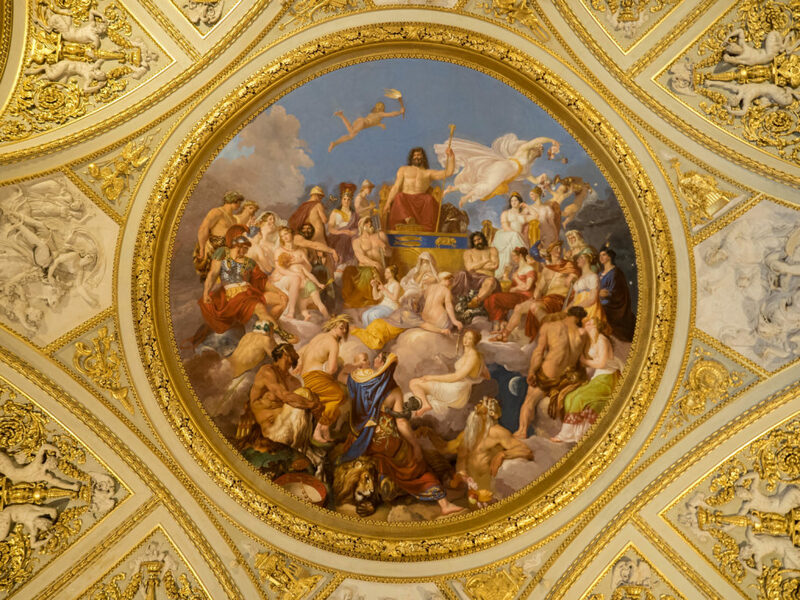 The original doors are now housed inside the Opera museum and a copy sits at the original site. The bell tower is also a separate building and contains 414 steps to the top. I actually climbed the dome of the cathedral and the bell tower back to back (go me!). If I had to choose one I would recommend the views from the bell tower. 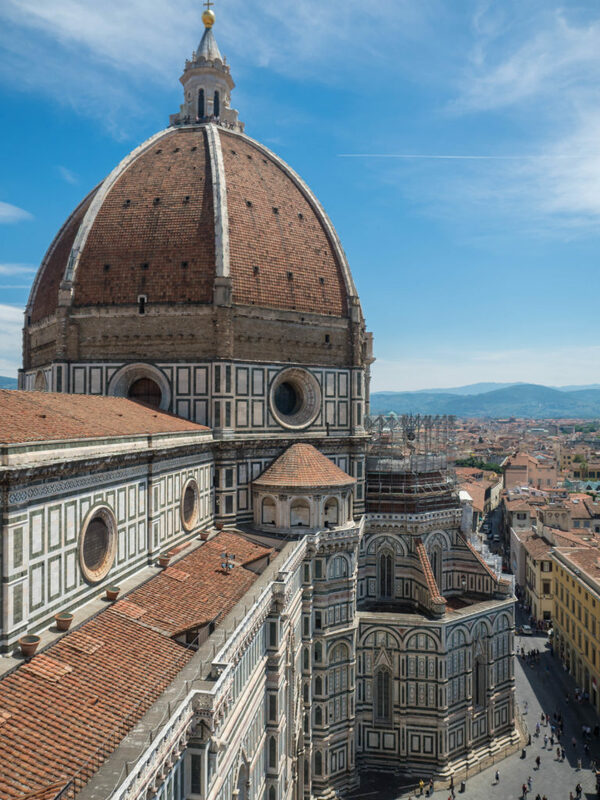 You get an amazing 360-degree view over Florence that includes the dome of the cathedral, which I think makes for better pictures. 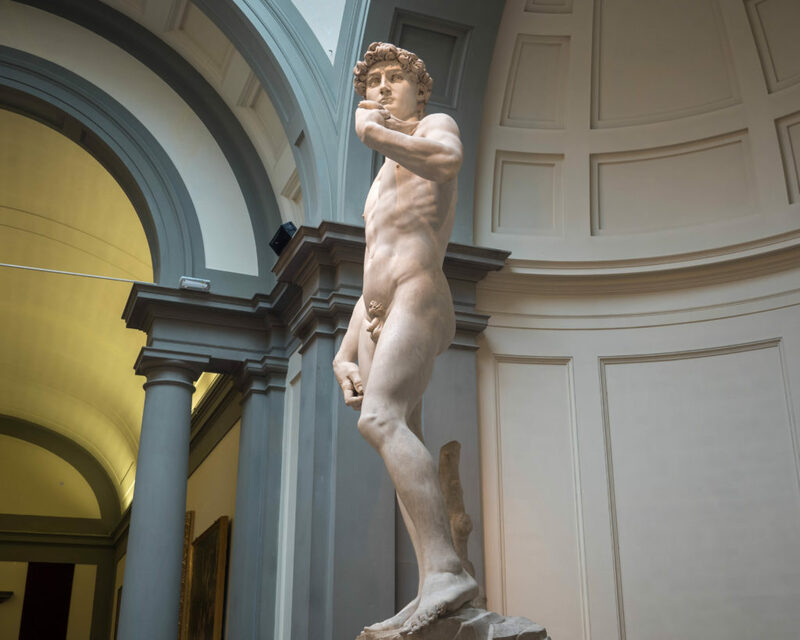 This famous sculpture by Michelangelo was created from one single block of marble between 1501 and 1504. It portrays David, from the story of David and Goliath, before he takes on the giant. 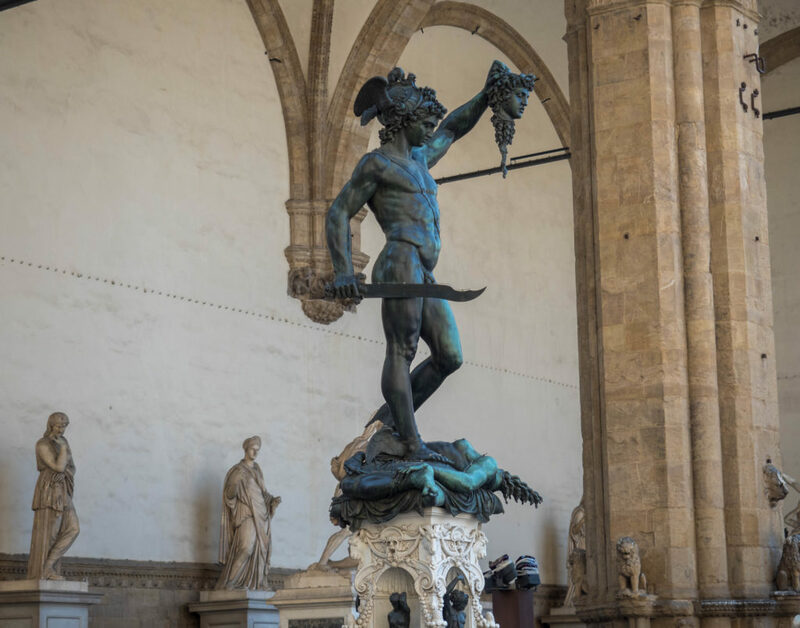 It’s located inside the Gallery of the Academy of Florence aka the Galleria dell’Accademia di Firenze. 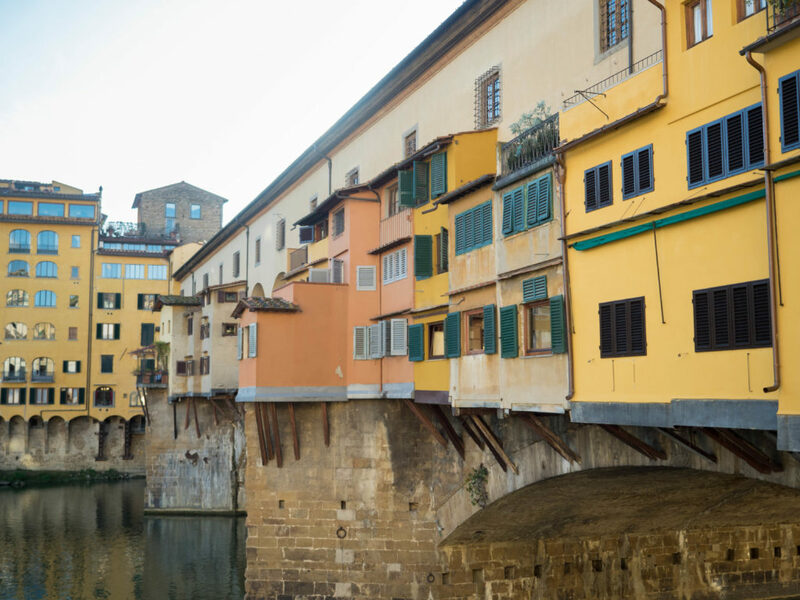 The Ponte Vecchio was the only crossing over the Arno river until 1218. There have been shops along the bridge since the 13th century and they were originally occupied by butchers, fishmongers, and tanners. Today you can find them filled with jewelers and goldsmiths. 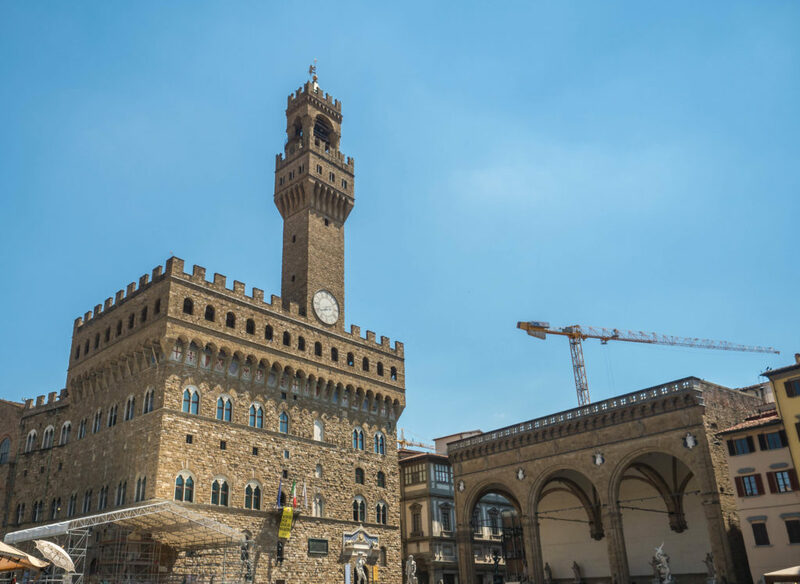 When the Medici family (who ruled Florence between 1434-1737) moved from the Palazzo Vecchio to the Pitti Palace, they needed a connecting route that would allow them to keep out of contact with the people. So a secret corridor actually runs above the shops over the bridge. 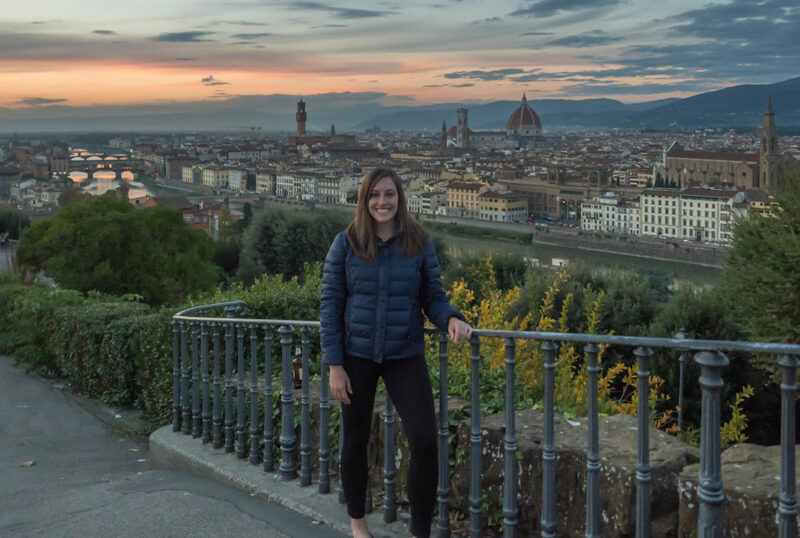 Now for one of my favorite parts of Florence, the panoramic view from Piazzale Michelangelo! It’s definitely a hike to the top, but so worth it. The view literally took my breath away. I’d recommend going at sunset, but by day or night it’s something you can’t miss. This square was the origin of the Republic of Florence and remains the site of political focus for the city. The most prominent building in the square is the old political palace, and to its right is an outdoor room filled with some statues that are worth checking out. 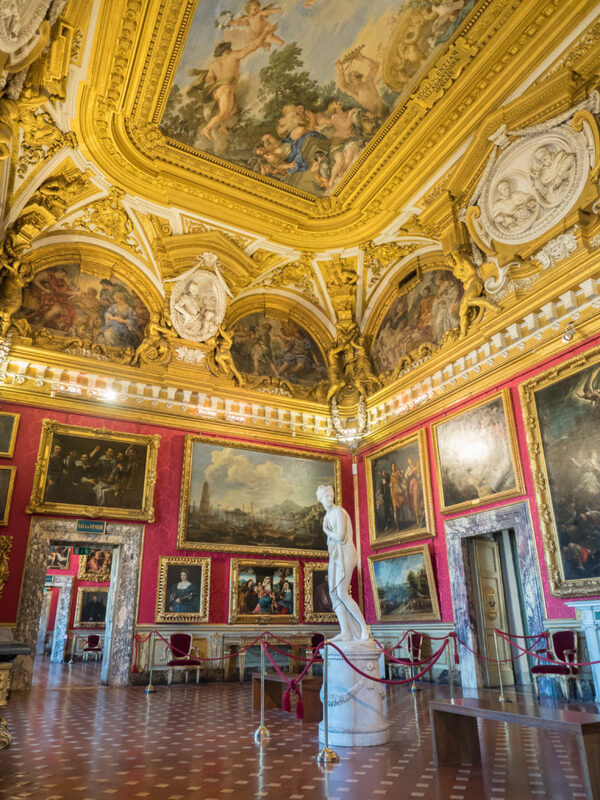 This museum houses the largest collection of Renaissance art in the world. 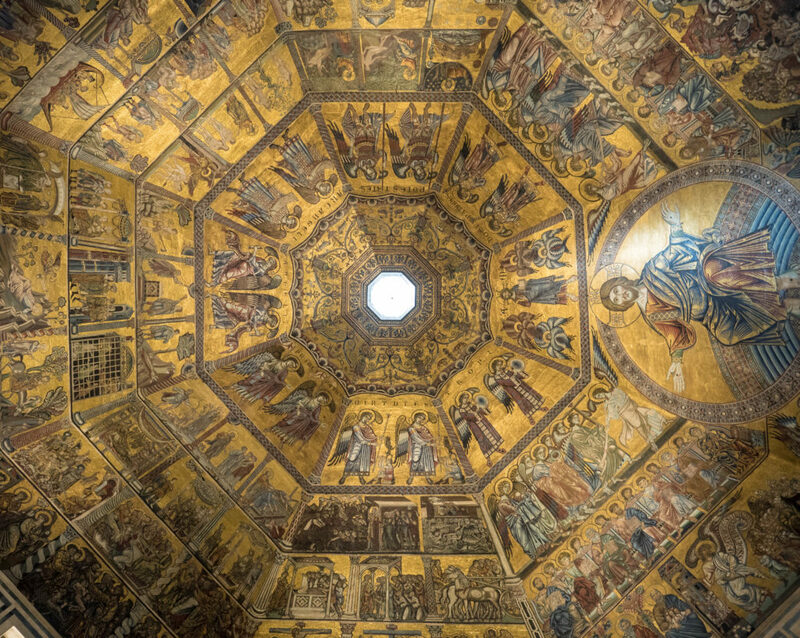 It’s famous for its sculptures and paintings from the Middle Ages to the Modern era and includes masterpieces from Giotto, Botticelli, Correggio, da Vinci, Raffaello, Michelangelo, and Caravaggio. Entrance fee: From Mar 1-Oct 31 it’s € 20. From Nov 1-Feb 28/19 it’s €12. Free entry on the first Sunday of each month. 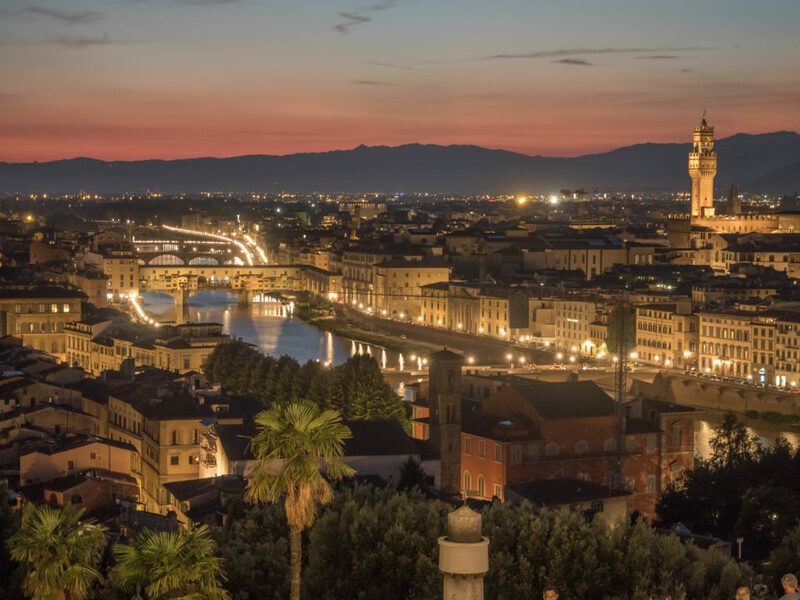 **Tip: Save money and buy a combined ticket for all three museums: the Uffizi, Pitti Palace, and Boboli Gardens. The price from Mar 1-Oct 31 is € 38 and from Nov 1-Feb 28/29 it’s € 18. 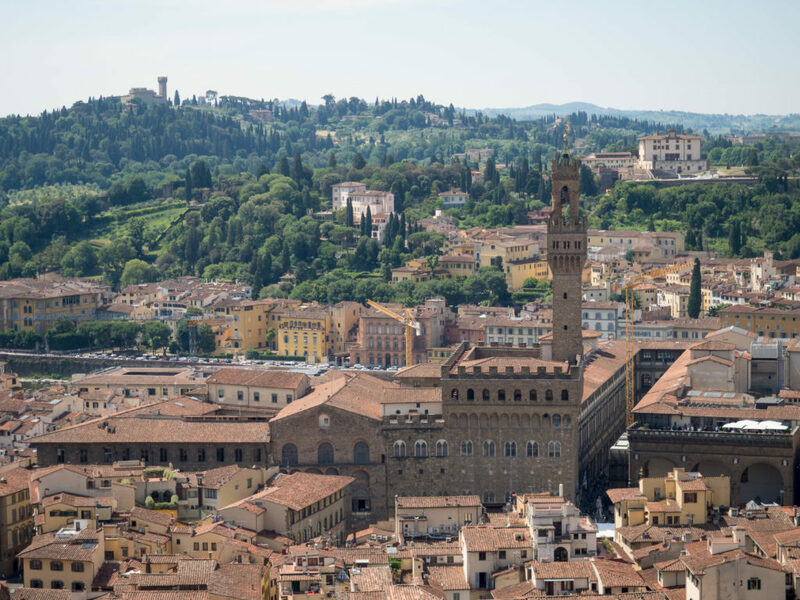 This palace was purchased by the Medici family in 1550, but still holds the name of its first owner Luca Pitti who was a prominent Florentine banker. 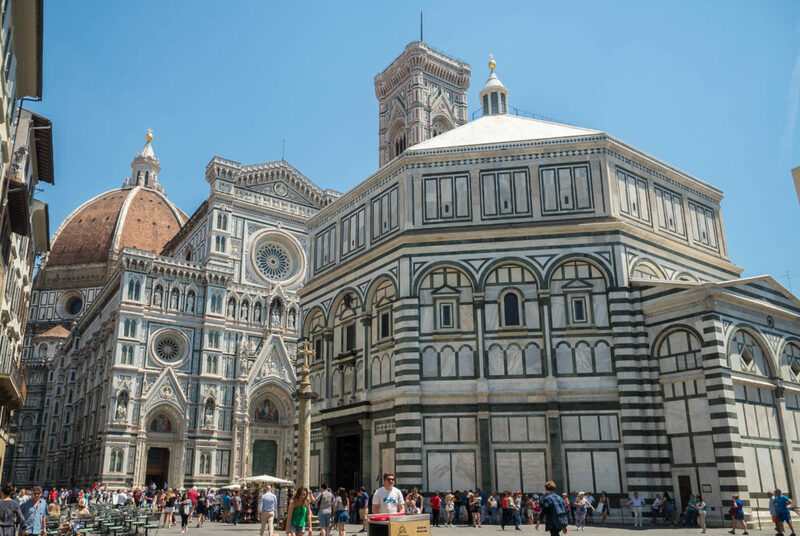 It was designed by Brunelleschi and built in 1457. Behind the palace lies the famous Boboli Gardens. 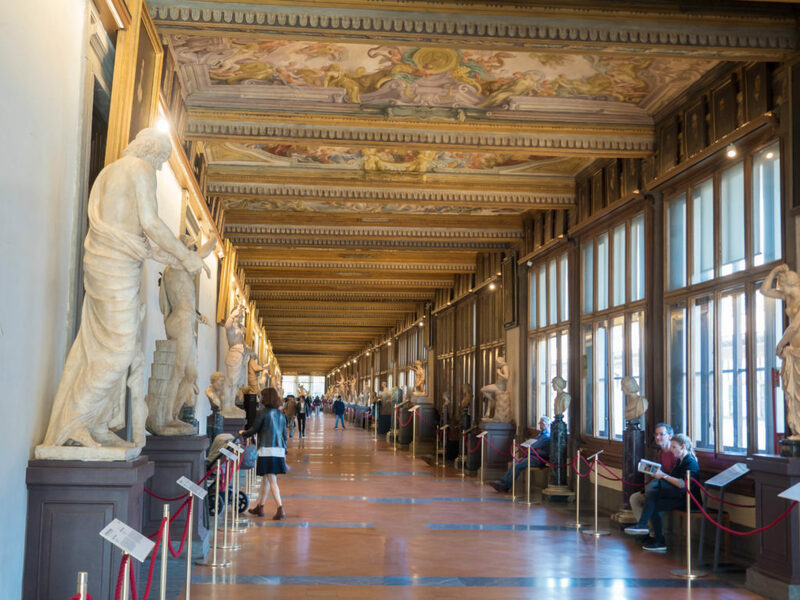 Today the palace houses some of the most famous museums in Florence including the Treasury of the Grand Dukes, Palatine Gallery (containing 16th and 17th-century art), the Royal Apartments (containings furnishings from the 19th century), the Modern Art Gallery, and Museum of Costume and Fashion. Entrance fee museums: From Mar 1-Oct 31 it’s € 16. From Nov 1-Feb 28/19 it’s €10. Free entry on the first Sunday of each month. 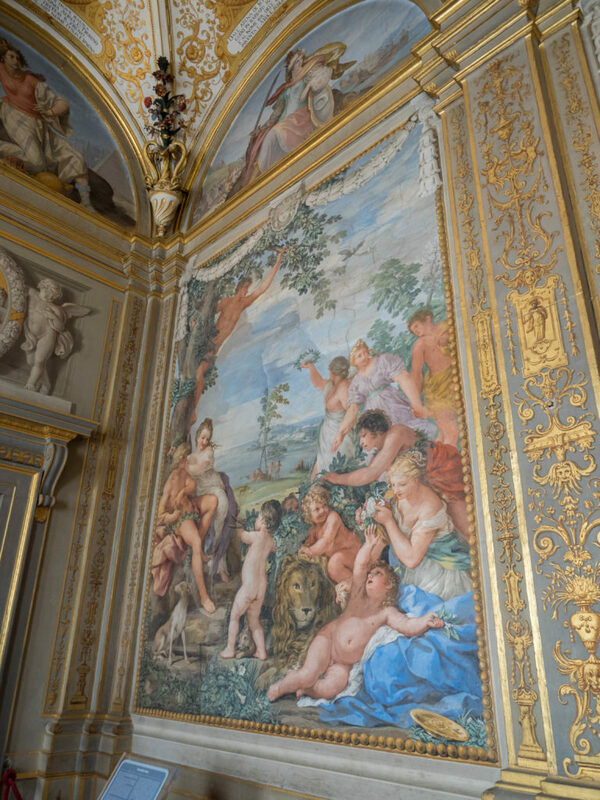 Entrance fee Boboli Gardens: From Mar 1-Oct 31 it’s € 10. From Nov 1-Feb 28/29 it’s € 6. Free entry on the first Sunday of each month. **Tip: 50% discount early in the morning – purchase the admission ticket before 8:59AM and enter until 9:25AM. 50% discount Wed afternoon – purchase the admission ticket after 3:00PM (up to February 28). Opening hours: Open from Tues-Sun from 8:15- 6:50 PM (Closed every Monday, Jan 1, and Dec 25). 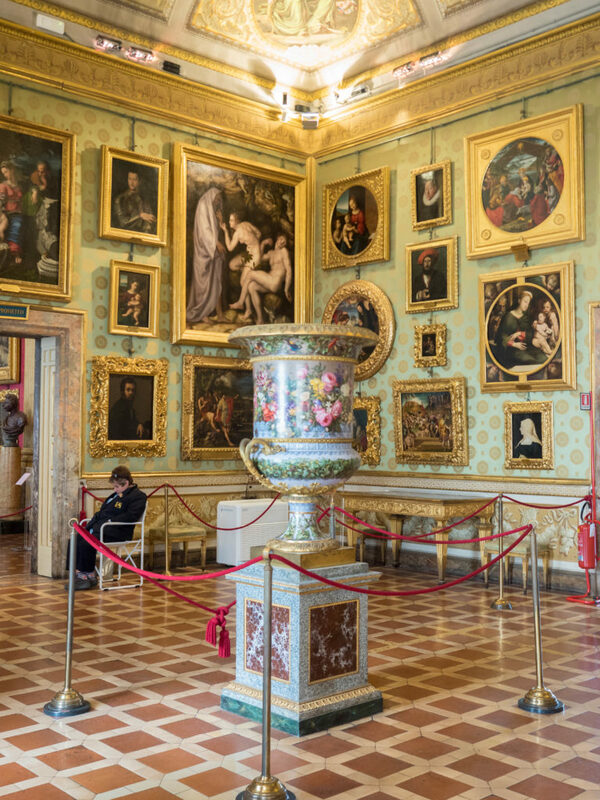 The Boboli Gardens are open from 8:15 AM daily and close between 4:30-7:30 PM depending on the season. Goofin around in front of the palace. 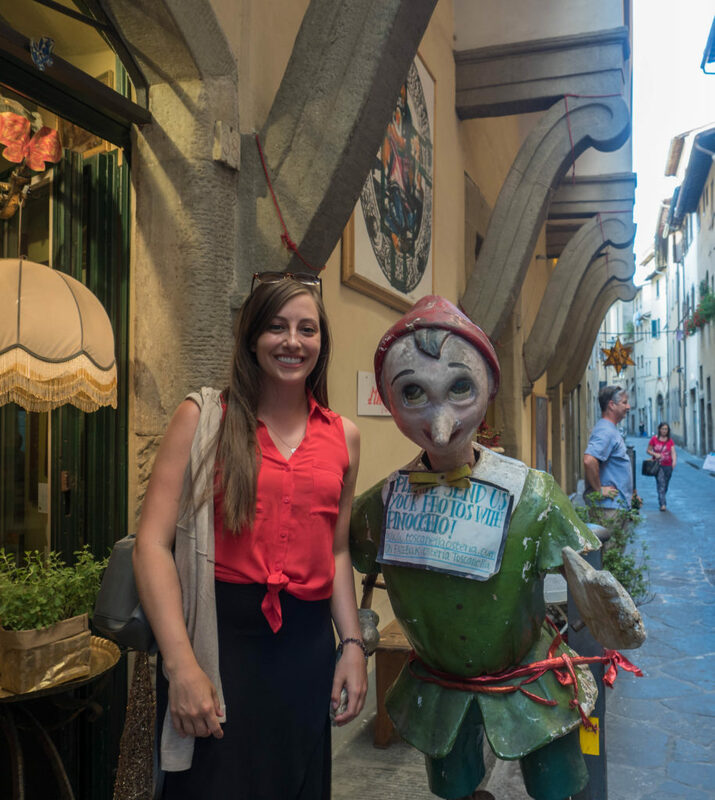 Did you Pinocchio was carved by Geppetto in a Tuscan village? You can find him all around town! If you made it this far thank you for reading! 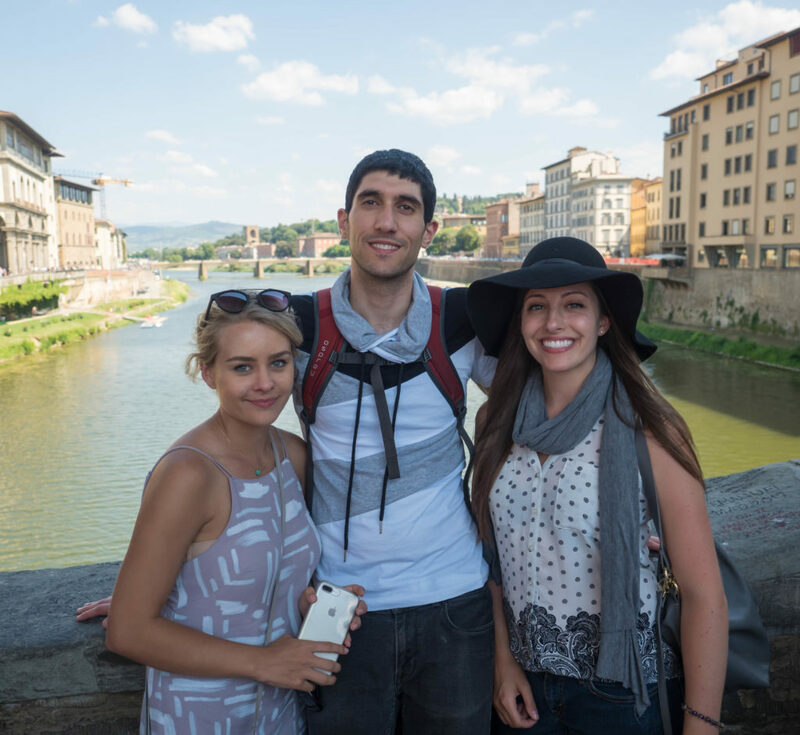 I have more posts to share about Florence and the Tuscan countryside so stayed tuned.